Chicago Blackhawks beat Tampa Bay Lightning win Stanley Cup. 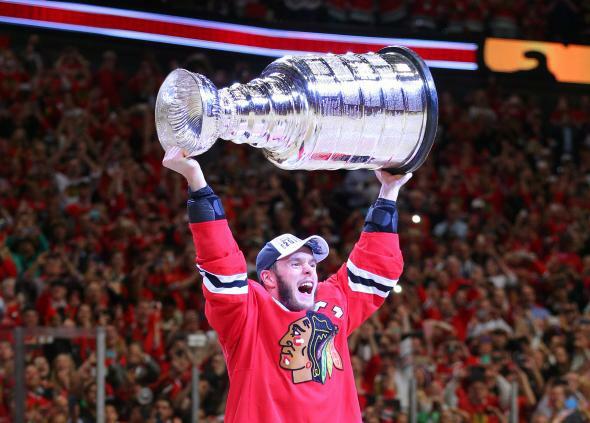 Chicago Blackhawks center Jonathan Toews hoists the Stanley Cup after defeating the Tampa Bay Lightning in game six of the 2015 Stanley Cup Final at United Center. The Chicago Blackhawks closed out the Tampa Bay Lightning Monday night to take home the franchise’s third Stanley Cup in the last six years. In a close-fought series, Chicago’s decisive 2-0 win was the only game decided by more than a single goal.